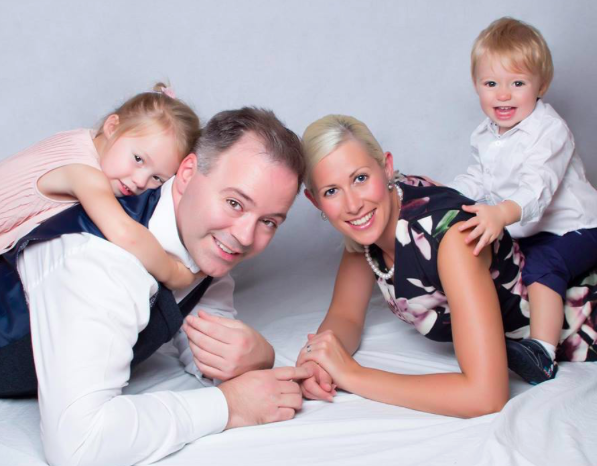 Tom Bennett, founder of ResearchEd and Chair of the government’s behaviour group, as well as Jon Richards, Head of Education Workforce for UNISON talk to @maternityCPD about why setting up a crèche at the annual UK ResearchEd Conference was important to them. Tom, can you tell us a bit about your own paternity leave or your partner’s maternity leave? TOM: I have a three year old and a one year old. My wife and I were lucky to be teaching when parenthood struck, so our statutory rights were clearly defined and upheld by our school. Anna took a whole year off for both, and I took my two weeks. When my first was born it was the beginning of a school year, and staffing was an issue, so I asked – and was allowed to defer my paternity even until after the statutory period within which it was allowed. Little things like that from a good school leader made a huge difference, and was a win/ win for school and employee (i.e. me). Why was setting up the crèche so important to you? TOM: ResearchEd is a teacher led, grass roots project aimed at getting teachers more engaged with good educational research so that students do better. I want as many teachers as possible to come to my events, which is why I have them on a Saturday, and also why we charge break-even ticket prices. Because I value open access, whenever we can, we have a crèche at our events. It mean that speakers and attendees who would otherwise be unable to come, have an option to do so, if child care is the barrier. Why did UNISON take the decision to sponsor the crèche? JON: I became aware of Tom via his amusing and informative posts on Twitter. He took up the challenge of setting up ResearchED with gusto and there is a great bottom-up and dynamic feel to the initiative. After the first ResearchEd Tom wrote an excellent booklet for us on behaviour management and he did it for a pittance and as ResearchEd has given us lots of food for thought and loads of contacts, we wanted to give back and help it grow. When Tom started talking about having a crèche it seemed a natural fit for us – thousands of Early Years’ workers are our members. Also, we are a union of 75% women workers and providing facilities to encourage as wide an attendance as possible is a natural instinct. What age range does the crèche cater for? TOM: We normally offer it from 1 up to 11 – after that it starts to feel a bit cruel for the child! We happily let parents bring their older children for free – if they can bear a day of educational research, I think they’ve earned a ticket! Most of the time it’s for children around the age of three. I think many parents with very young children probably prefer to leave them with a known and trusted child carer rather than someone new, and older children are probably easier to find help with. Have any teachers attended ResearchEd whilst on parental leave? TOM: Yes, last year we had a lady who brought both of her children; she said she was so happy because, as she was at home a lot she felt very remote from education and teaching, and that this was a great way for her to feel part of it again. That was a delight to hear. What logistical or practical tips can you offer other conference facilitators interested in providing a crèche for their attendees? TOM: It’s a piece of cake! There are loads of great mobile crèche companies online who cater for events like ours. In fact, the one we use is called The Mobile Crèche Company and they’ve been fantastic. A great feature they have is that they send a link and parents who want to book a space can go online themselves and enter their child’s details, special needs and other important info, saving me (the organiser) a lot of admin. I’d also advise making it known right from the start that you offer crèche facilities to potential attendees. After all, the whole point is to encourage people who might not otherwise attend, to do so, not just offer an add on for those already coming. 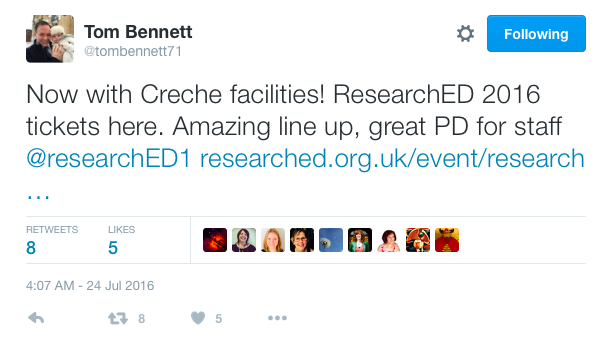 How has the provision of a crèche benefitted ResearchEd? TOM: For us it echoes our core values: encouraging access, supporting participation, and reaching out to sectors that might otherwise be marginalised. It creates a larger pool of available talent, broadens our audience base, and is also a great feel-good factor for the day. What’s not to like? !